XStore makes e-commerce easy. 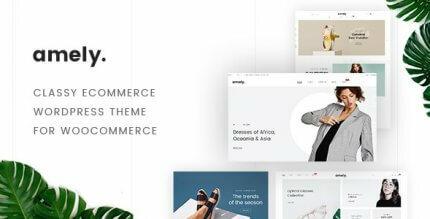 This elegant and intuitive WordPress theme from Themeforest magazine is carefully developed and includes that set of pages, tools and settings that will help you create a professional looking and trustworthy online shop. Also, XStore comes with several widgets that will help you improve the user’s perception of your shop. The Theme Options is user-friendly and requires no special knowledge, adding value to a beautifully responsive theme. Premium plugins included for free (save 250$). 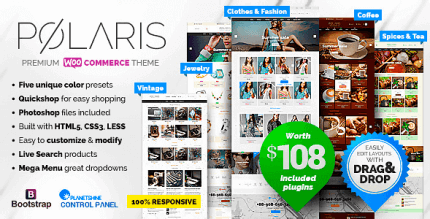 WPBakery Visual Composer, Revolution Slider, Smart Product Viewer, Infinite Scroll & Ajax Pagination, Subscribtio WooCommerce, Gmaps for Visual Composer, WooCommerce Amazon Affiliates, Massive addons for Visual Composer and other plugins comes free with this theme. 200+ PSD files included. Show your imagination, design your website, complete the look and much more with included psd files. Product page options. You can adjust your Single product page structure using different page layouts and customize with ease the elements on the description page. Sharp hoover effects. Theme goes with included impressive hoover effects collection – use them to add value to your user`s experience in the shop. You can use the available options to customize these effects even further. Brands filter option. Long awaited filter for your brands is already available. Sort your various brands just by clicking on it`s 1st letter. Unlimited cart icon. Theme included differently stylized cart icons for you to choose the one that would match your website manner. Versatile header styles. Xstore comes with a set of different header variants. You may customize fonts, adjust colors, change font sizes and more. Responsive and Retina-ready. Theme layout is fully-responsive, and automatically adapts to the screens of tablets, smartphones, desktop PCs and laptops. A powerful Admin Panel. Advanced Admin Panel offers plenty of options, available through an intuitive interface. The Page Editor has additional elements. Xstore is fully integrated with the Visual Composer advanced drag and drop interface. It will help you organize the shop`s elements efficiently. Can I get the new version XStore 2.4? Thank you! Just realized… once re-download it again, my points being deducted. 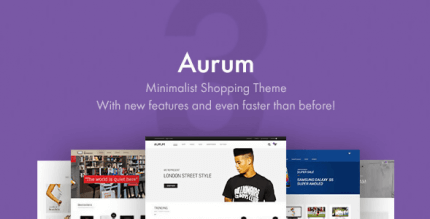 One of the most impressive e-commerce themes I have ever seen! Overall value of bundled plugins as well as customization possibilities within XStore’s admin panel are absolutely insane. Would highly recommend for any sort of project based on WooCommerce! I want to purchase 1 theme, but I read FAQ from your Support. WPNULL is not supporting an item when the item is updated. I think this is a barrier when buyers want to approach Wpnull. I request an idea like Wpnull can update <5 times for an item when the user purchased. Or: if the item is not changed any method to null. WPNull can continue support buyer get an item. Or provide a link (not null) of theme for the user, can download. Because WordPress is update daily. Always have holes about security. An old version of the theme is not compatible with only newest WordPress version. I would be happy to receive an open answer from wpnull. If you can change the policy, even a little. I believe there will be many users will use your service. Because I know nulled a theme will have difficulties, but some pretty easy to nulled theme. You have any primary items have lifetime update or `4 or 5` time update, marketing it, you have customers, and those people will introduce to their friends. Like me. Thank you. I got it but it doesnt work cause it need a purchase code to start the wizard. It is best seller in codecanion in store cayegories. Can you update to 5.0.3?